A man dressed in fatigues and carrying a rifle went on a rampage, killing three police officers and wounding two others. Police posted to social media a photograph of a man dressed in fatigues, carrying what appeared to be a rifle. Thursday morning, the shooter was still on the loose. Residents were asked to keep their doors locked and their outside lights on, as helicopters hovered overhead and the hunt for the gunman continued. UPDATE I: Suspect is identified as 24 year old Justin Bourque. The police have warned Canadian residents not to provide police movements on social media so not to put police in more danger in trying to apprehend the suspect, 24 year old Justin Bourque, the individual alleged to have killed three Royal Canadian Mounted Police officers. Police state that Bourque is “armed and dangerous” and it warned residents to stay indoors away from windows and to lock their doors. New Brunswick RCMP have confirmed that three officers were shot and killed and two other officers were wounded by a heavily armed gunman Wednesday evening in Moncton. Paul Greene, an RCMP spokesman, said Bourque was last seen in the wooded area near the Pinehurst subdivision. Police are asking people to keep their doors locked and leave their outdoor lights on. RCMP Const. Damien Theriault could not say how many police officers were involved in the manhunt. 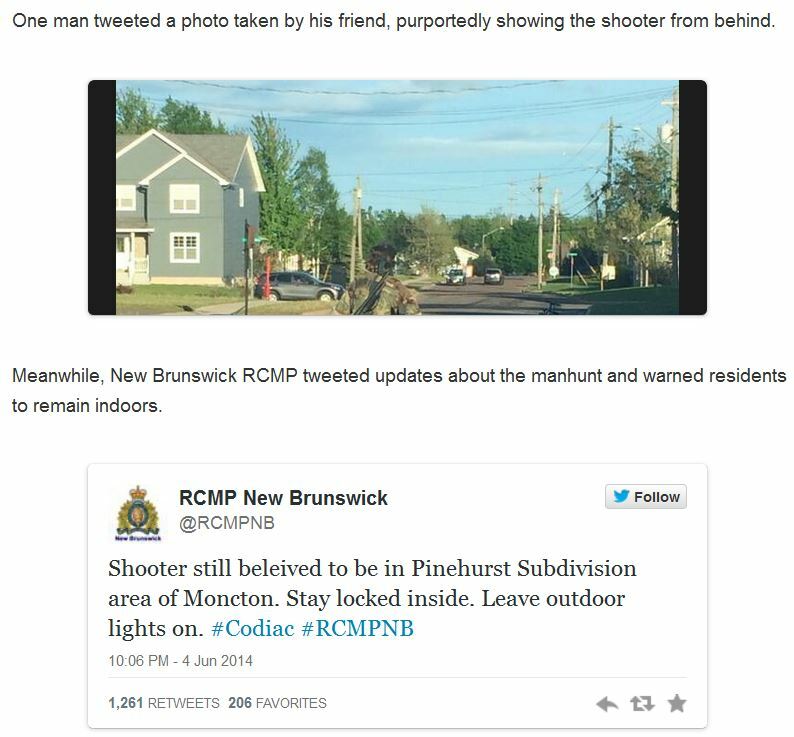 UPDATE II: Horror of Moncton shooting captured on social media. Canadian police Friday arrested the suspected shooter who killed three police officers and wounded two others in a small city in eastern Canada, bringing an end to a 30-hour search that terrorized local residents and captured the attention of the country. The Royal Canadian Mounted Police said Justin Bourque, a 24-year-old who allegedly killed three RCMP officers and injured two others late Wednesday, was arrested in a wooded residential area in Moncton, New Brunswick, shortly after midnight. It said charges were pending. 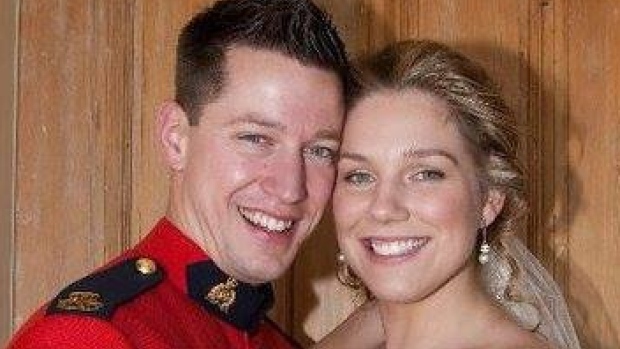 UPDATE IV: Dave Ross ID’d as one of the Mounties killed in Moncton shooting. Const. Dave Ross, a Quebec-born Mountie who had lived in New Brunswick for seven years, has been identified as one of three RCMP officers killed in Moncton, N.B., Wednesday night. Ross was a married father of a 19-month-old with another baby on the way, his mother-in-law told CBC News. UPDATE V: Hundreds gather at vigil for fallen RCMP officers. The RCMP has confirmed the identities of the fallen members are. From left: Const. Dave Joseph Ross, Const. Fabrice Georges Gevaudan and Const. Douglas James Larche appear in photos released by the RCMP. • Const. David Ross, 32, from Victoriaville, Que. Ross, a police dog handler, leaves behind his wife, who is six months pregnant, and their young son. He graduated from the police foundations program at La Cite college in Ottawa and joined the Codiac Regional RCMP in 2007. In a statement, La Cite president Lise Bourgeois described Ross as a “model student” and said the school will keep its flags at half-mast to honour him and the other fallen officers. • Const. Fabrice Georges Gevaudan, 45, from Boulogne-Billancourt, France. Gevaudan was posted to the Codiac RCMP detachment in 2008 and worked as a general duty police officer. • Const. Douglas James Larche, 40, from Saint John, N.B. Larche was posted to three RCMP detachments since 2002, most recently in Codiac where he worked in highway patrol and as a general duty officer. In 2008 Larche received a Commander’s Commendation for saving the life of an unconscious baby in Moncton. Police have surrounded what is believed to be a Moncton rooming house and numerous heavily armed officers are arriving on the scene as of early Thursday afternoon. A loudspeaker could be heard saying “come out with your hands up,” according to reporters on the scene. The RCMP released a map of where they believe the gunman is holed up and have set up roadblocks and are searching vehicles. They are asking motorists to avoid the Pinehurst subdivision. Beyond saying Bourque is 24-years-old, however, police have not released any other details about him. An active Facebook page that appears to belong to a Justin Bourque in Moncton, N.B. features several pro-gun and anti-police photos and rants. Many of the posts are meme photos with text written on them. “Free men do not ask permission to bear arms,” says one photo, with an image of Revolutionary War fighters on it. Another image shows a handgun and bullets with following text: “I will help you: 1. Shop for your first firearm 2. Learn firearm safety 3. Train with your firearm 4. Find ammo, mags and parts FREE.” Another post shows the wages for various politicians, including the prime minister, compared to the income for active soldiers and soldiers on pensions. There is an American connection. Justin’s Facebook page had a “friend” named Neil Bourque who may be a relative. The profile for Neil Bourque is now gone but last night it stated he was born in the US. He had a number of postings that were violently anti-police. Police in Moncton have apprehended the suspect who allegedly shot and killed three RCMP officers, according to the Saint John Telegraph-Journal. The arrest came after the RCMP search for a heavily armed lone gunman who allegedly shot and killed three Mounties and wounded two others in Moncton, New Brunswick carried on late into Thursday evening.